Aromatic structures provide basic architecture for developing functionalized materials such as Active Pharmaceutical Ingredient (API). However, methods for chemoselective, regioselective and stereoselective introduction of various functional groups onto aromatic rings are still limited in terms of their applicability. This project aims to provide a novel approach to functionalizing aromatic compounds by developing the chemistry for newly designed superelectrophiles, i.e., highly electrophilic organic species. The direct amidation of aromatic compounds is one of the recent finding (shown below). 2. Molecular design of new compounds exhibiting characteristic structural features and properties based on non-planar amides and related molecules. We revealed and utilize the structural features of a bicyclic amine, 7-azabicyclo[2.2.1]heptane derivatives, which induce non-planarization of amide functionalities upon N-amide bond formation. This feature can also be applicable to related p-functionalities. For example, N-nitrosamines of the relevant bicyclic amine take non-planar structures, which lead to potential NO/NO+ donors. Aliphatic N-nitrosoamines of 7-azabicyclo[2.2.1]heptanes could undergo heterolytic N-NO bond cleavage. 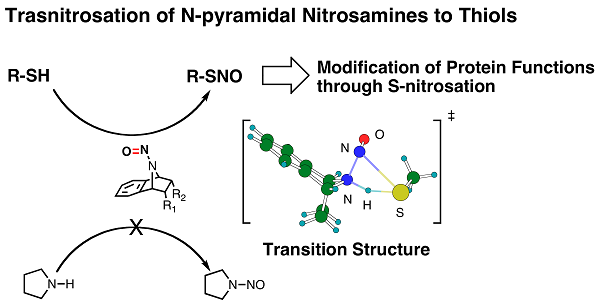 Based on the observation of reduced rotational barriers of the N-NO bonds in solution and nitrogen-pyramidal structures of the N-nitroso group in the solid state, we postulate that N-NO bond cleavage of N-nitrosamines is enhanced by a reduction of the N-NO double bond character. These bonding features facilitate transnitrosation reactivities as show below. We applied this chemistry to inhibit internarization of b2-adrenerin receptor upon activation of agonist through S-nitrosation of cystine residues in G-protein kinese 1 (GPK1). Nitrogen pyramidalization is also found in the N-amide derivatives of 7-azabicyclo[2.2.1]heptanes. Oligomers based on N-pyramidalized amide linkage of bicyclic b-amino acid derivatives are also studied. Robust helical structures are generated as shown below. 3. Design and synthesis of intelligent molecules to contorol functions of membrane proteins. We have a great interest in synthesizing chemical modulators that could control biological phenomena through interactions with membrane proteins such as ion channels, G-protein-coupled receptors (GPCR), and transporters. One of such we focus on is phospholipid-like modulator. Lysophosphatidylserine (lysoPS) is known as an exogenous inducer to potentiate histamine release from mast cells (MCs) even at submicromolar concentration. It is also proposed to control immunological events. In the initial stage of this project, we identified lysoPT, a threonine-containing lysophospholipid and its 2-deoxy derivative as strong novel agonists, through our SAR studies on lysoPS derivatives against MC degranulation. LysoPT and its 2-deoxy derivative induced histamine release from MCs both in vitro and in vivo at a concentration less than one-tenth of that of lysoPS. Notably, lysoPT did not activate GPR34, a recently proposed lysoPS receptor on MCs, indicating the presence of another undefined receptor involved in MC degranulation that is reactive to both lysoPS and lysoPT. Thus, the present strong agonists, lysoPT and its 2-deoxy derivative, will be useful tools to understand the mechanisms of lysoPS-induced activation of MC degranulation. 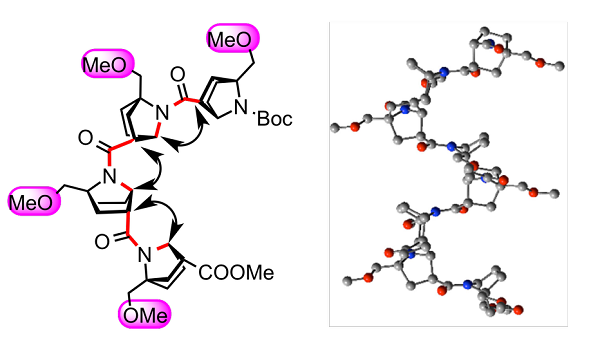 We are now interested in the design and synthesis of lysoPS derivatives that are potent and subtype-selective agonist of lysoPS GPCR receptors, GPR34, P2Y10 and GPR174. 4. Computational Studies of Organic Reactions, Structural Basis, Drug Design and Molecular Dynamics. Application of ab initio molecular orbital/DFT calculations are carried out as a part of efforts to understand the structural features, selectivities, and reaction mechanisms. Similation-based design of the molecules are also considered to be important. Combination of computational works with experimental observations is highly encouraged in our researches. Copyright © 2014 東京大学大学院薬学系研究科薬化学教室 All Rights Reserved.